Finca Las Torviscas (Registration no. VTAR/MA/01310) is set in a magical secluded location. It was designed by its artist owner to maximise the views of the mountains, sea and North African coast line. Set in 5 acres, over looking wild and natural countryside with hardly a neighbour in sight, yet, only 2 km from the village of Gaucin. The finca used to be an Almond farm and has Figs, Carobs and Olives as well as lots of Almond trees. At the heart of the house is an open plan kitchen/dining/sitting area with glass skylight giving a bright and airy feeling. Large glass double doors lead onto a vine covered terrace and another set of glass double doors lead into the sitting room/TV room with DVD, DVD library, games, books and fireplace. The house is uniquely decorated with many original art works and a stunning Moroccan tile and oak floor throughout the main living area. There are 2 bedrooms on this level, the master with large king sized bed and my daughters room with 1 single bed (110 x 90 cm), a hall from the main living area connecting them to the bathroom with bath, shower, basin and WC. 2 further rooms are down outside steps on the pool level. These are accessed from a covered terrace as well as the 2nd bathroom with Shower, basin and WC. Outside there is the large partly covered roof terrace with 360 degree mountain/sea views with chill out seating area, eating table and chairs and sun beds, perfect for sunset drinks, dining and star gazing. The vine covered patio just off the dining area has a sofa, arm chairs and large mosaic coffee table. The pool (8 x 4 mts) is accessed by steps from the patio or by a lawn garden with Palm tree. There are many mature plants and climbers around most of the house. The swimming pool is surrounded by natural stone and a decking at the far end. Being on the slope of El Hacho mountain the spectacular view is over the orchards down the Genal valley to the sea and over to the coast line of North Africa, being on the roof terrace feels a bit like you are flying. Parking is right next to the house. The rest of the land is ripe for investigation, there are beautiful walks directly from the house including the old smugglers track from Gibraltar. My house is a unique home and full of character, the things in it all mean a lot to me and have been collected over the years, it is not a smart Ikea furnished villa. Most of the furniture has a story and to some, may seem lived in, this is the way I like it, I hope you like it too, if this is not your kind of style, please look else where. There are 3 cats living at the property, they are very friendly and are not the guests responsibility though they may be around. Access 100 mts unmade track. Gaucin is the most beautiful of the white villages of Andalucia, with its ruined Moorish castle, rising above on sheer cliffs, guarding a panorama over a landscape of oaks, cork trees and craggy peaks to the sea. Gibraltar is usually visible in the background, as are the Rif mountains of Morocco. It is an area of breathtaking beauty. There are many beautiful walks with abundant wildlife. 2 very clean rivers for picnics and swimming and Europe’s largest cork oak forest all within 20 mins drive. Caves with prehistoric paintings and Ronda with its beautiful old town, Roman ruins and the oldest bull ring in Spain within 40 mins drive. There are many good bars and restaurants in the village and neighbouring villages. Horse riding, Yoga, Pilates, massage, baby sitting, guided walks and bird watching can all be arranged. The the sea and beaches are only half an hours drive and a bit further, but well worth the drive(1 1/4 hour) are Tarifa and Bolonia. With 10KM beaches, wind sports and hip nightlife. Whale and dolphin watching, Old town Tarifa is a walled Moorish town with great eating and funky shops. Morocco and the old port of Tangier is a 45 min boat ride from Tarifa. There are many other interesting place to visit, the historic cities of Seville, Cordoba and Granada all possible in a day trip. Malaga is fast becoming a top cultural destination for the Arts, Befitting the birth-place of one of Europe´s great Modern Masters, Pablo Picasso, Malaga has enjoyed an incredible cultural revival over the past decade, with the opening of the Museo Picasso, Carmen Thyssen Museum and the Contemporary Art Museum (CAC). Adding to this already impressive list, the first ever “Pop-up Pompidou” opened last spring. It is the first international branch of the French museum and will be located in The Cube, a striking €5m glass building in the city’s new Muelle Uno harbour development, with permanent and temporary exhibitions including works by Picasso, Ernst, Bacon, Magritte, Attia and Frida Kahlo. The city also has 2 massive hilltop citadels, the Alcazaba and ruined Gibralfaro, remnants of it’s Moorish rule. I come from a fairly remote part of Scotland and have always loved wild and natural landscape. I am an artist and paint mainly landscapes. I bought Finca Las Torviscas because it has the most perfectly composed view. I have lived and worked here on and off for 10 years, and painted my view many times. I find it, if anything, more interesting in the winter when the light, weather and atmosphere is often very dramatic. I first fell in love with Spain whilst driving to Morocco, During Easter 2000 I visited a ruined house on a beautiful little farm (finca) a few miles from Gaucin, I totally fell in love with it and the landscape around it. I knew very little about Gaucin, but found it to be a lovely place. The village is very beautiful, breathtaking views, very safe and friendly with quite a large and interesting expat community. It is also a great place for children, in Spanish restaurants they are always welcome and are totally safe in the village. When at my house I always feel inspired. It is very secluded and you will never tire of the view. Chilling out by the pool, star gazing from the roof terrace, walking the smugglers route across the mountain or dining on the terrace. My house is a unique home and full of character, the things in it all mean a lot to me and have been collected from many years of travelling, it is not a smart Ikea furnished villa. Most of the furniture has a story and to some may seem lived in, this is the way I like it, I hope you like it too, if this is not your kind of style, please look else where. The master bedroom and the bedroom with a single bed are connected to the bathroom by a small hall. It has bath, separate shower and WC. The lower bathroom for the 2 downstairs rooms has shower and WC. There are 2 inside living areas, 1 open plan entrance/kitchen/sitting/dining area with a round table and chairs under a Moroccan style glass skylight. Wood burner. Double doors lead to the other sitting room with sofabed, TV/DVD, internet, iPod speakers. 1 large oven with smaller oven apart. The kitchen is open plan and hand made from oak. It is well equipped with gas hob, electric oven, dish washer, fridge/freezer and many other appliances. 3 terraces, one outside the main living area, a large roof terrace with 360 views and a smaller terrace in front of the lower rooms. There is skiing in the Sierra Navada, but it is too far for a day trip... unless you are a very early riser (about 3 hours from here). This is the Costa del Golf! There are at least 25 top quality golf courses including Valderrama, Sotogrande, and San Roque within 40 mins drive. Three new top courses have opened near Casares within the last year, which aiming to rival Valderrama in a few years. Notes on accommodation: If you require the central heating it will be charged separately. All bed linen and towels are provided and there is a maid to clean and change the linen usually on Saturdays. Pets considered. There is an English speaking agent who will meet and greet you and be available should you have any questions. Outside: The large partly covered roof terrace with 360 degree mountain and sea views with eating table and chairs, perfect for chilling, sunset drinks, dining and star gazing. The vine covered lower patio just off the dining area has a sofa arm chairs and large mosaic coffee table. Lawn garden with Palm tree. There are many mature plants and climbers around most of the house. The 8 x 4 mt swimming pool is accessed by steps is surrounded by natural stone and a decking at the far end, Lower covered terrace leads to the 2 lower bedrooms and bathroom. Being on the slope of El Hacho mountain the spectacular view is over the orchards down the Genal valley to the sea and over to the coast line of North Africa, it feels a bit like you are flying. Parking is right next to the house. The rest of the land is ripe for investigation, there are many amazing walks directly from the house including the old smugglers track from Gibraltar. Utility Room: Washing machine in lower bathroom drying rack Cleaning / Towels / Linen / Maid service: All towels and linen are provided. If your stay is 2 weeks or more, cleaning and a change of linen and towels is included at the end of every week but, can be arranged more often if required. Other: Large French windows lead onto the shady vine covered terrace, with table and chairs and unbeatable views out over the mountains and down to the Med. 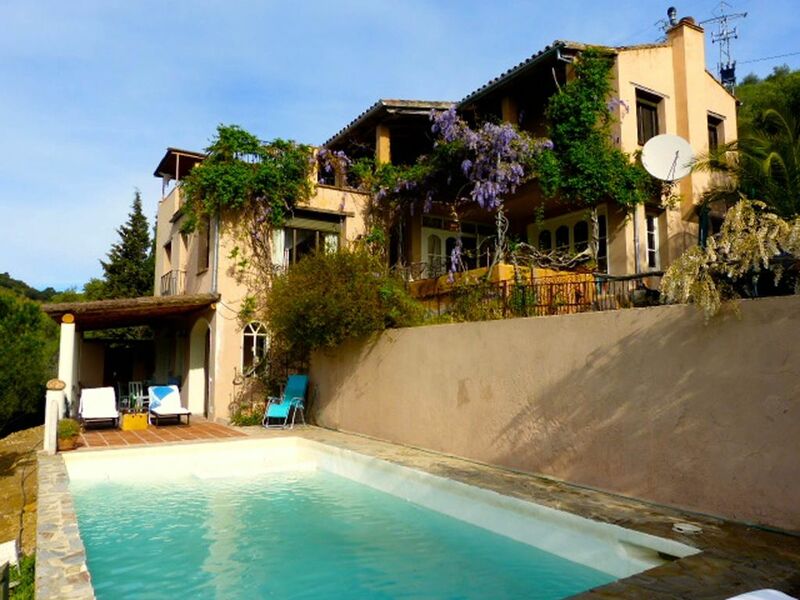 Very charming and comfortable house, with an exceptional location with spectacular views. My family of 5, our 3 kids aged 7, 7 and 8 in age and my wife and I absolutely loved this place. The pictures cant capture the amazing setting this place is in. Gaucin is beautiful as are all the neighbouring towns. The house was home from home. The setting was quite and peaceful. We star gazed every night. Saw loads of wildlife including eagles and wild Boars! I'm normally ready to go home after being away 10 days but none of us wanted to leave. Thank you John, I am so glad you enjoyed my house so much, it really means a lot to me. This property consisted on 3 levels. I’d recommend it for a group that is happy (we were) with 2 bedrooms on the lower level next to the pool and the top level that had the dining room kitchen and master bedroom. So our teenage kids retained a sense of privacy from us. Secluded but not remote. Great value too. Thank you Joe & Sarah, very happy you enjoyed your stay and appreciated the decor and views. Stunning views and lovely villa in a beautiful part of Spain! Loved the styling of the rooms and musical instruments. The cats were so gorgeous. The top terrace Is an amazing place to have a drink early evening and enjoy the sunset. Our family had a wonderful time at this well equipped villa! Thank you so much Hayley. It is so nice to know when people have appreciated the house and the cats of course! The whole family really enjoyed our week staying in this lovely house. Very comfortable with great views. Hope to return! Thanks Rebecca, so glad you enjoyed it. Hope to see you here again. I took my family here for a week at the end of July and we all were desperate for a holiday. Having only seen the villa on the internet we were nervous that it would not live up to our expectations. We should not have worried, the photographs do not do it justice. The whole place has been designed by an artist and if I wanted to do it myself I would not have done it differently - it is absolutely stunning. To be honest we hardly left the house as the kids loved the pool and we loved reading on the terrace and drinking in the beautiful view. It has everything there that you could need as Victoria and her daughter live there the rest of the year, so it never feels like some of those austere villa rentals that you get, it feels like home from home. You even have board games and dvds for the kids and wifi if you need it. I was loathed to write a review as this is one of those places that you want to keep a secret, but as I have booked for two weeks this year, other people should share the experience. If you do want to go out then the local villages are fantastic and every one seems to have an Olympic sized out door pool for one euro a day. Also we spent a day horse riding which was amazing and a day on the Atlantic beaches at Tarifa. Gaucin also had a flamenco festival which was a huge experience for the kids until 2am! Having said that we never left we seem to have done alot, but we always made sure that we came back to the villa in plenty of time. I am trying to think of reservations but it is difficult to do so. Do book this villa but don't tell anyone about it until you have your return visit booked!!! Thank you Dav, I can't say much more than that! I hope you have a wonderful holiday here again. We're able to organise the following activities. Guided walks, guided rides and/or riding lessons. Off road trail biking (not July and August), Babysitting. Catering, raw food catering, massage, yoga, Pilates, aromatherapy, reflexology and bird-watching. Painting lessons taught by local artists. trips to Tangiers, Chef Chauuen, Asila and more Morocco. Beaches are a 30 minute drive. A few kilometres down the Valley is the river Genal, a good spot for fishing, swimming and exploring. In the other direction is the Rio Guardiaro down by Estacion Gaucin (Colmenar), also great for the above activities. The Mediterranean beaches are half an hours drive away, while Tarifa on the Atlantic coast, famous for its huge white sand beaches and wind surfing is 1 1/4 hours drive, check the weather forecast for wind. Car hire recommended. Malaga 1½ hours drive (many cheap flights). Gibraltar 50 mins, (BA & Monarch). Jerez, 1½ hours (Ryan Air). Seville, 2½ hours- many cheap flights. Estepona 40 minutes. Ronda 35 mins. Seville 2½ hours. Granada 3½ hours. Jerez 2 hours. Gaucin is a spectacular, unspoilt white village with many food shops, a chemist, bank, bars, several acclaimed restaurants both Spanish and English run, and 2 tennis courts. Overlooking the village are the ruins of a wonderful Moorish castle which gives incomparable views towards the Mediterranean coast, North Africa and Gibraltar. It is an ideal base for day trips to places like Ronda, Jerez, Cadiz, Seville and the Atlantic Coast. This part of Andalucia is a paradise for walking, exploring, riding and bird-watching. The tennis courts in Gaucin are free and available on a first come first served basis.